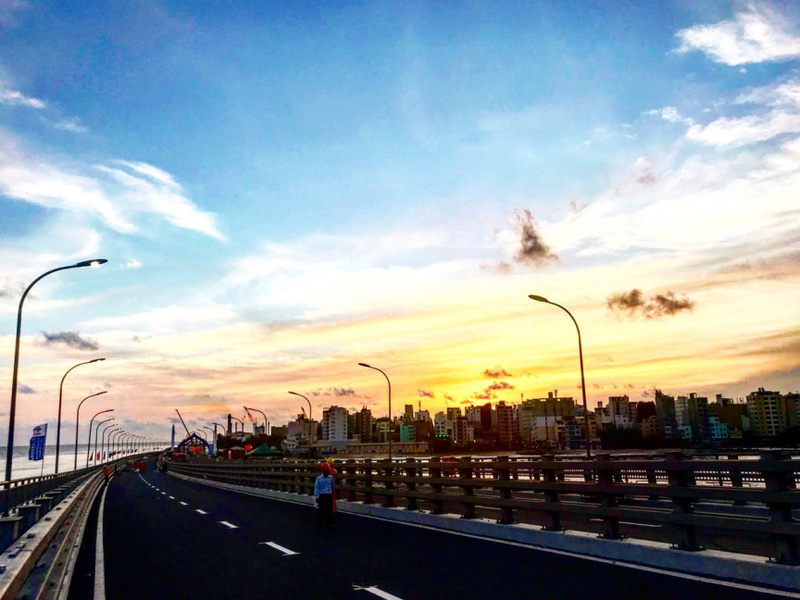 Minister of Housing and Infrastructure, Dr. Mohamed Muizzu has said that the bridge between Male' City and Hulhule' being officially opened tomorrow night will be opened to the public starting from 7 September. Speaking at a press conference at the Housing Ministry today, Dr. Muizzu said that the tarmac work on the roads connecting to the bridge along with the roads linking Hulhule' and Hulhumale' would be completed before the bridge is opened to the public. While the our roads of Male' City connecting to the bridge are being developed as "Male' Ring Road", the Housing Minister said that the trees to be planted on the roads are being brought in. The Minister has previously said that over 50 trees would be planted on those roads. With an official date set to open the bridge to the public, the government has yet to announce the toll fees for the bridge. Minister Dr. Muizzu told the press today that the toll would not be expensive. With a total of four lanes set for the bridge, the Housing Ministry said that there would be two lanes on each side and one lane would be allocated for motorcycles and public transport. MPL is set to provide bus service on the bridge. Dr. Muizzu said that although the bridge is being opened tomorrow, celebrations would be held for seven days which would have the bridge open to the public to take pictures at set times. Special activities during the bridge celebrations include the weddings on the bridge, parade by the Maldives National Defence Force, motorcycle and car shows organized by the youth along with events by Bike Maldives, Schools and for Children with special needs. The China-Maldives Friendship Bridge project worth USD 200 million was contracted to China's CCCC Second Harbor Engineering.